I've been subbing a lot lately while Hubby is home with the kids during the day and taking night class to get his teaching credential. While my favorite assignments are chemistry and math, I sub from kindergarten up through high school and everything in between. One of my elementary classes was comparing numbers using greater than and less than when I remembered this number fish game I made for my kids. They still love playing with it. 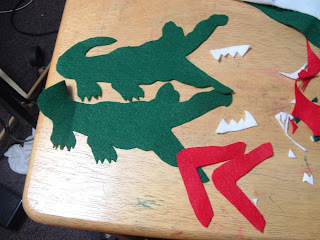 Then I thought...I should make them an alligator to help them practice comparing numbers...perfect since an alligator eating the bigger number is often how we teach kids to remember how to use the greater than and less than symbols...which apparently blogger won't actually let you use in written text. So I thought I would post my first non-felt-food project with felt today in honor of Fun Felt Friday's over on Camp Slop, so head on over and check out her blog after you've checked out this post. I think Heather's Felt Fridays officially start next week, but her blog is awesome. There's plenty of other cool stuff to look at. Here's what we did. I found this image via google image seach. I copied it into Word and made it bigger. Then I used my computer screen as a light box and traced the shapes for the head, mouth, and teeth and then drew the body for it myself. I wanted the head exaggeratedly big so that it would stand out. 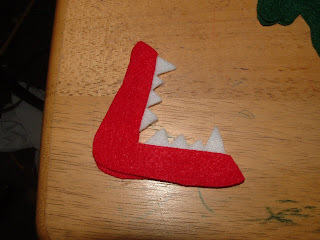 Then I sandwiched the teeth between the two red mouth pieces, and sewed along the edge to hold the teeth in. 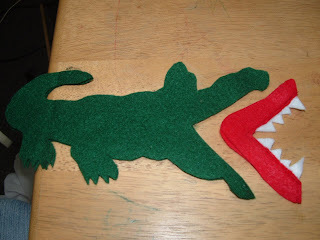 Then I sandwiched the mouth between the two alligator pieces and sewed. Then you're done. 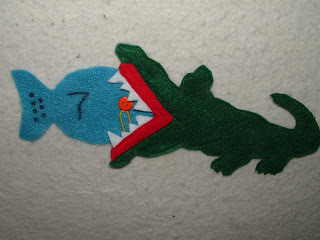 As you can see, my alligator is still blind, but it seems to find fish to swallow anyway. I was going to do eyes with embroidery thread...and maybe I will...but who knows when I'll get around to it. I let Firecracker out of bed for a trial run, and she had no problem using the alligator for two number fish. Adding the numbers up on multiple fish was a bit tricker...which wasn't a surprise since we're working on her adding lately. 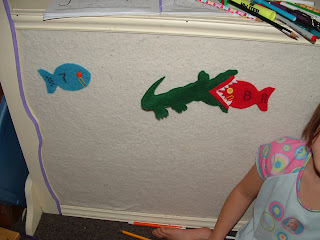 You could also put up fish without numbers and have your child decide which side has more fish. Like the flannel board that's part of our puppet theater? Click on the link for more info. If you're looking for some extra cute counting fish, check these out by Counting Coconuts. So for all of you that don't want to go through all that to get your pattern for making a Number Crunching Alligator, you can print mine, and I even included my number fish pattern for good measure. 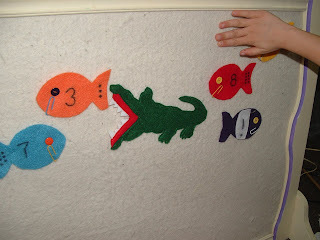 Please click here to download the printable Number Munching Alligator Pattern. I can talk about "greater than/less than" with no problem, but I always want to put the little symbols backwards. Maybe I need an alligator! Very clever - a good teaching tool, and fun. This is such a clever and cute idea!! Thanks for linking up! I really like this idea - and I think it's how I was taught the concept, but we didn't have the awesome visual. I linked to it on my weekly roundup, and thanks for the link to your flannel board, too! Thanks, Polly for your nice comment! 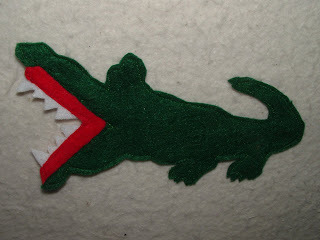 I LOVE the concept behind your fish and alligators. :) AND they're really cute! !